As you’d expect, we maintain the highest standards across the whole dental practice. But don’t take our word for it. 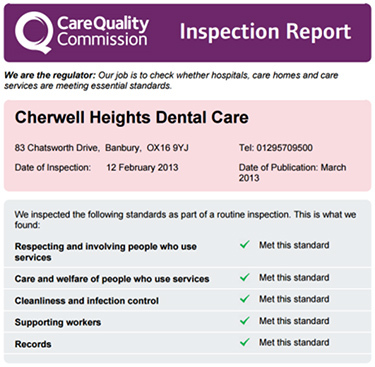 The Care Quality Commission report on our practice is available to all on-line [ www.cqc.org.uk – just look up Cherwell Heights Dental Care ]. The CQC monitor, inspect and regulate services to make sure they meet fundamental standards of quality and safety and they publish what they find, including performance ratings to help people choose care. They also set out what good and outstanding care looks like and they make sure services meet fundamental standards below which care must never fall. When they inspected our practice we met every standard they set. While meeting these exacting standards for us is a ‘given’, what really matters to us is you – the patient. We feel we get assessed by every patient at every visit and our standard is to make sure you are satisfied – every time.